Wet rooms are becoming increasingly sought after as an addition to any stylish abode and it's not hard to see why. They add a luxury hotel feel to any home and can really add value to your property. All of our super stylish options can be customised exactly to your taste, so your wet room will be just what you desire. First things first, when installing a wet room you need to figure out the drainage. We recommend a wet tray, available in various sizes, or we can even custom make one to suit your exact wet area dimensions. The tray provides a waterproof solid base with built in falls to the drain area and it also provides a perfect surface for tiles to adhere to. Once this is complete, then the room needs to be waterproofed. This involves priming the floor, the lower section of the walls and the whole of the wall area around the shower. It can then be covered with a syrupy membrane. We have a range of fantastic products to help make this task as easy as possible. We offer wet trays, Blootoe shower trays and linear drains in all shapes, sizes and colours, to create the perfect wet room solution. Then it's time for tiling! Get the latest look for your wet room with our large format tiles. The tiles create a wide open space, with minimal grout maintenance and are really on trend at the moment. The tiles are incredibly easy to clean and come in a number of different sizes. The sizes include an impressive 1800 x 800m, but any tile can be easily altered to fit your space. Also, why not make a splash with our porcelain wood effect tiles? These are not only great for the floor, but equally as amazing for the walls. Wood effect tiles give your wet room a contemporary and natural finish and come in a variety of shades and sizes. The upkeep of the tiles is effortless, meaning that you will save money in the long run. Wood effect tiles have been around for centuries and are often overlooked as a timeless classic. Not only can they add a contemporary feel to any wet room, wood effect tiles are always hugely popular regardless of what is in fashion. To finish off your perfect wet room, we have the best range of showers for you to choose from. From basic exposed thermostatic showers to the utmost in luxury ceiling mounted heads, we have it all at our showroom. 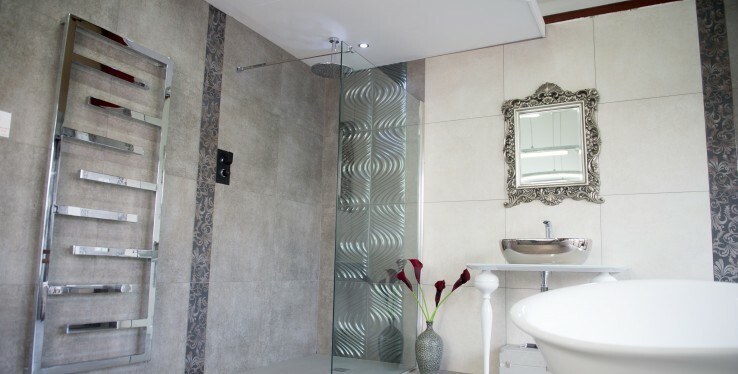 We can also supply you with luxury shower screens, which can be fully clear, obscured, smoked or etched designs. These are really easy to clean and finish off your wet room to the highest quality. Again, a range of styles and colours are available to you at the best price. Speak to our experts in the Cheshire showroom about the latest body jets and digital controls to really bring the wow factor to your project. At Real Stone, Tile and Bathroom we want to bring your ideas to life for the best prices. For more information on our wet rooms, visit our beautiful Cheadle showroom on the Stanley Green Trading Estate or call us on 0161 485 1373.